Tonight’s dinner with friends will be on the casual side. As such, it calls for casual clothing that still has a touch of summer. Rather than rely on the khakis/buttondown/loafers trifecta, why not lead the style pack with a bit of linen, denim and suede? I’m just hoping that I won’t clash with the appetizer. Dried apricot dressed up with a round of goat cheese and topped with a candied walnut. This entry was posted in Entertaining and tagged Entertaining, Friday casual, recipes. Bookmark the permalink. 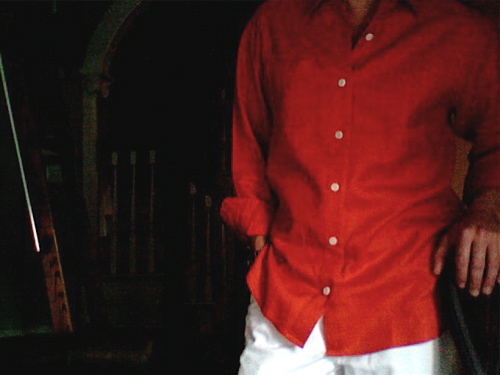 Linen in any color with white jeans and a driving shoe would get my engine started for a very relaxing weekend. Thank you Patricia. It is a winning combination that I wish I saw more of. I have a hard time remembering life before the driving shoe. I’m sure I’m flattening already horrifically flat feet — top and bottom, they resemble spade blades — but I love them. Especially since Mrs. E. and I both drive standards. N.B. the walnuts are carmelized, not candied as I originally stated. There’s nothing like linen on a summer’s evening, and paired with white denim, why, it’s perfect. The appetizer sounds delicious. That is the perfect combination of elegance and luxury. How come most guys can’t grasp how easy it is to wear that in the right fabrics? I guess it’s true, ‘You’ve either got or you haven’t got, style’! Hello TIG, I’m saving the kaftan for Saturday night. I might opt for a jaballa (sp?) instead… Something to go with the red Turkish slippers with the turned up toes which should also distract from my rapidly expanding middle. Claudia, I think it is a combination of two things: worried about what people might say about their masculinity and not really giving a damn about how they look anyway. LOL — E+E, certain your middle is just as elegant as the rest of you. There wouldn’t happen to be any photographs of Saturday night’s attire, would there? TIG, not a one… and I like it just fine that way. Thank you, RJW and happy weekend.